A prediction error plot shows the actual targets from the dataset against the predicted values generated by our model. This allows us to see how much variance is in the model. 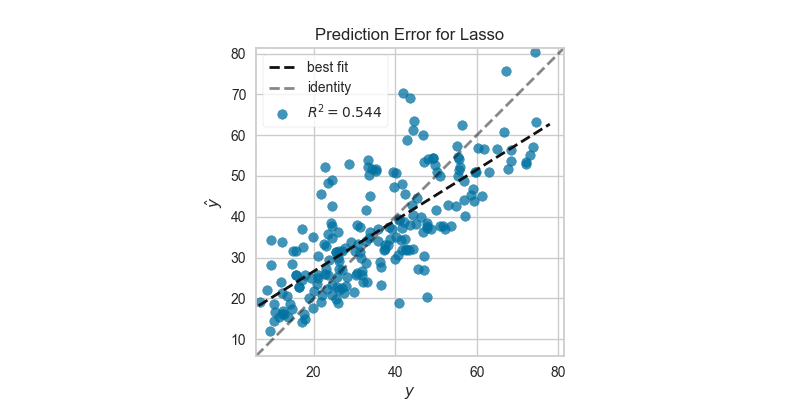 Data scientists can diagnose regression models using this plot by comparing against the 45 degree line, where the prediction exactly matches the model. The prediction error visualizer plots the actual targets from the dataset against the predicted values generated by our model(s). This visualizer is used to dectect noise or heteroscedasticity along a range of the target domain. If shared_limits is True, the range of the X and Y axis limits will be identical, creating a square graphic with a true 45 degree line. In this form, it is easier to diagnose under- or over- prediction, though the figure will become more sparse. To localize points, set shared_limits to False, but note that this will distort the figure and should be accounted for during analysis. Draw a linear best fit line to estimate the correlation between the predicted and measured value of the target variable. The color of the bestfit line is determined by the line_color argument. Draw the 45 degree identity line, y=x in order to better show the relationship or pattern of the residuals. E.g. to estimate if the model is over- or under- estimating the given values. The color of the identity line is a muted version of the line_color argument. PredictionError is a ScoreVisualizer, meaning that it wraps a model and its primary entry point is the score() method. The score function is the hook for visual interaction. Pass in test data and the visualizer will create predictions on the data and evaluate them with respect to the test values. The evaluation will then be passed to draw() and the result of the estimator score will be returned.